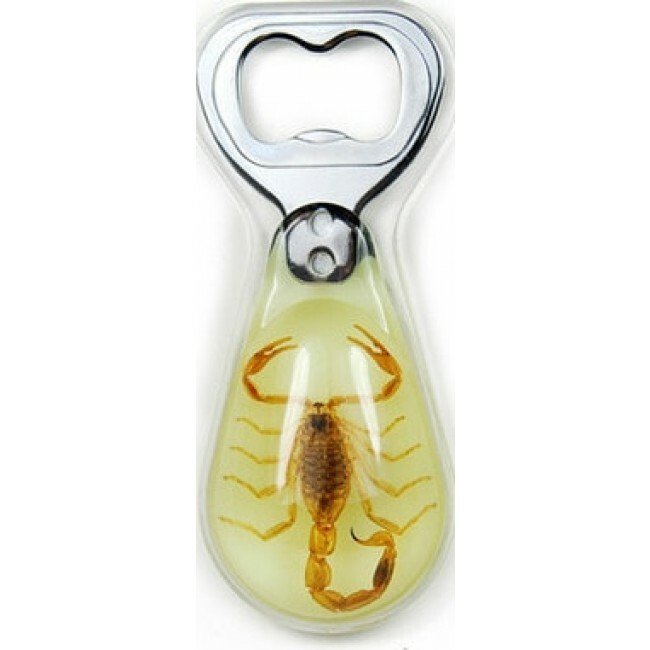 Unique magnetic Bottle Opener contains a REAL Glow in the Dark Glow in the Dark Golden Scorpion preserved forever inside its acrylic handle. Let your inner arachnologist out! Size 4"x1 1/2". A natural way to appreciate nature up close and without the itch. With its curious swirl of science and style, this unique magnetic Bottle Opener contains a REAL Glow in the Dark Glow in the Dark Golden Scorpion preserved forever inside an acrylic handle. Opener has a stainless steel mouth.